Plan a dream double wedding with a best friend. A double wedding ceremony needs a plan so everyone understands how to bring everything together for a perfect special day. 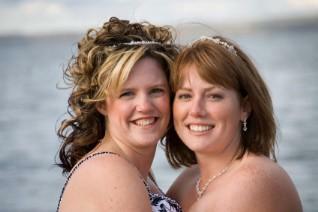 Best friends, close cousins, or sisters often decide on a double wedding ceremony. Chances are no one knows how to plan this cost-effective and unique wedding. There are several areas that requires careful planning and attention to detail to ensure this event happens without any surprises. The wedding ceremony itself brings up a lot of issues. Before brides can even discuss their own ideas of the correct order of a wedding processional, they need to work out bridal party members, officiants, location, and decorations. It will be crowded at the altar with two sets of bridesmaids and groomsmen. Keep things simple by either agreeing on the same bridal party members or choosing just one or two people to stand up together. Coordinate colors and attire styles to make things look unified. Choose people who are close to both couples to do weddings readings or oversee the guest book sign-in. Picking someone to officiate a double wedding can be extremely difficult if the couples are from different religions. In this case, a civil ceremony may be best for the double wedding, hosting a religious ceremony at a separate time for immediate family and friends if desired. Couples who have different religious backgrounds may be surprised to find their religious leaders willing to do a double wedding, so they should always ask if that is an option. The location chosen has to be large enough to accommodate the entire guest list of both couples. In addition, it should have ample room at the front of the ceremony site for all of the bridal party members to stand and be seen. Though the creative wedding ceremony idea can be crowded, it will work with a little detailed staging. Eliminate processional issues by finding a site with two aisles, allowing members from each party to walk down their "own" aisle. Alternatively, wide aisles also allow more than one person to walk at the same time, so pairing one party member with another is not a problem. Decorations also need to be agreed upon by both couples. Décor should reflect both sets of newlyweds' tastes and wedding colors. Simple wedding flower arrangements, pew bows, and candelabras are cost effective and can be made to compliment any ceremony location. Throughout the double wedding planning process, communication is crucial. It can be easy to get into an argument over which wedding march mp3 to play and have it blow out of proportion. Dividing the cost by percentage of total wedding guests; for example, the couple with 63 percent of the total guest count pays for 63 of the total costs. Agreeing upon categorical percentages based upon what is more important to each couple; for example, the first couple may care more about the flowers, while the second couple may want to spend more money on a photographer for photos before the ceremony begins. Regardless of how the two couples decide to split costs, they must communicate this before planning gets underway. Write down the financial plan and have all four people sign it, making copies for everyone. As vendors are booked and bills begin rolling in, make sure everyone has a copy of everything. Avoid fights by hiring a planner. It may just be too stressful for busy brides and grooms-to-be to coordinate how to plan a double wedding ceremony. Family members and close friends may want to preserve their relationship while still having their dream double wedding. In these cases, hiring a wedding planner is in everyone's best interest. A wedding planner will not only take both couples' visions and incorporate them into the perfect wedding ceremony, but will help negotiate any issues between the two brides and grooms. The cost of the planner should be split evenly, as she is providing both couples with a much needed service. She can also keep track of bills and payments, keeping things civil financially. A double wedding is a wedding money saving idea that couples may consider if they have similar thoughts on dates, locations, and style. It will be a day that will be shared with not only their significant other, but the other two people who mean the most to the couple. Compromise and communication are fundamental to planning a successful double wedding.